The Scottish Library and Information Council (SLIC) has been shortlisted in the Film Society of the Year Awards for its innovative Film Education in Libraries project. The Film Education in Libraries project has been shortlisted in two categories – Film Discovery Award and the Community Award. The project, which is supported by £190,000 National Lottery funding from Creative Scotland, is piloting community film clubs at six public library services at the City of Edinburgh Council, Falkirk Community Trust, Midlothian Council, Culture North Lanarkshire, South Ayrshire Council and Western Isles Council. The aim is to improve the provision of film and moving image education across Scotland. 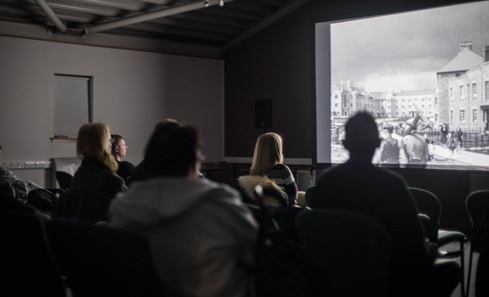 The film clubs have been taking place in rural, remote and inner-city settings, targeting children, older people and young offenders with screenings of archive film footage relating to the local area. The clubs have been designed to tackle social isolation and improve literacy among different groups of library users. "Just like great books, great films have special powers to communicate, share experience, provoke thought and expand our understanding of ourselves and each other. It's great that the libraries are giving all of us the opportunity to share some time and films together. Access to films for everyone is something to be celebrated and enjoyed. I hope this project helps people get even more from our libraries." Scott Donaldson, Head of Film Education at Creative Scotland said: “These nominations recognise the important role film clubs and film education play in connecting communities with film and moving image, and connecting people with each other - key aims for Scotland's libraries and the role of culture in their national strategy. The winners of the Film Society of the Year awards will be announced on Saturday 11 November at the Showroom Cinema in Sheffield. The annual awards are run by Cinema for All, a national support organisation for community-led cinema, helping communities across the country to deliver film screenings.